I just thought I would give an update on some of the additions I have made to the player's in-game options menu. There are two, and they both appear on the front menu option panel: Adding Map Pins and Renaming A Weapon. Adding Map Pins is as simple as pressing the Add Map Pin button. This will then add a map pin directly in-game, which also updates on the map (in the traditional manner) after the player exits and enters the area again. This can also be updated manually by the player selecting the Update Map Pins button, which becomes available when there are map pins to update. The third button, Edit Map Pin, selects the nearest pin to the player and allows them to edit the comment from another GUI that pops up. Again, this only becomes selectable when there is a map pin to edit. I have also taken care to ensure players can only edit their own map pins. 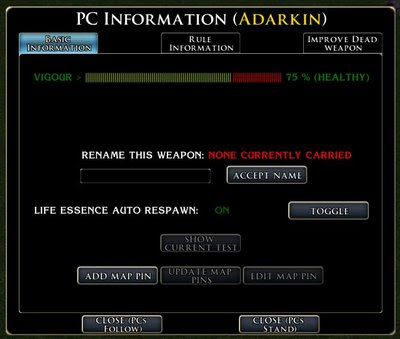 There is a small chance that Obsidian may add some code in a later patch that will replace the need for this menu option. However, as I have now finished it, I will leave it in place just in case. The second new GUI option is the ability for a player to rename a weapon that they carry in their right hand, up to a maximum of 24 characters. I needed this function for the players as some weapons in the new era can deteriorate (Dead Weapons), meaning the player may wish to reflect this in the name of the weapon. I have currently disabled the ability to write in numbers as part of the name, as this is not in keeping with the spirit of the campaign. In other words, there is no ability to write Longsword +4. Although, I suppose a player could call it Longsword Four if they really wanted to. However, I am trying to help players avoid naming a weapon to something that may mislead them in the future if their weapon deteriorates. E.g. A weapon that is +4 enhanced and has 2d4 fire damage may have traditionally been called a Flametongue +4. However, if this weapon deteriorates with use, then it may lose the +4 enhancement or the flaming damage, and so it would be wiser to call it something along the lines of Flametongue only ... unless it loses its flaming damage as well over time. This all sounds extremely interesting. Can you name the map pins with your system? Can the map pin feature be used outside of your campaign? If so, then it would be amazing if you could release it some time soon, ahead of your mod, either in the form of a GUI or item-based tool. I would download it in a sec, as would many others I presume. Yes, you name the map pins when you place them, and you can also edit them at any time with the EDIT MAP PIN button. The edit button edits the closest map pin you are standing to (as long as you were the player to set it in the first place). Yes, the feature could be used outside of the campaign, but would obviously need another GUI to replace my "PC Option" menu, which has more options than those outside the campaign would require. This would be easy enough to do though. I did consider releasing it as a standalone facility, (and still may). The only reason I held back for the time being is because Obsidian might bring back map pins in the near future, and so it would make my "utility" redundant. If, however, this does not happen, and/or I get the time to extract all the neccessary scripts, then I will upload this version anyway. As I say in the blog, there is one workaround that I had to use that "official" map pins would not have to use, and that is the need to exit and enter the area to allow the pins to show on the map. I have got around this by adding a button that jumps a player out and immediately back in (to the same spot), which oviously takes a few seconds to do, but does work. That all said, maybe I should just release it and see how things go. ;) I will post again if I do. Lance, I would like the ability to be able to write numbers as part of the name. Can you add this back in please. Map Pins Have A Future?